As far as I know, the first appearance of the 750 Pantah. Because that's what the man with the suit and white-red cap told me. The one is of course Dr. Taglioni. On the bike Walter Cussigh, on of the top-three finishers in the Formula 2. The one with the helmet is Mauro Ricci, also very fast an accustomed with Duc's. The third rider I forgot, think a lost the original program over the years. Also somewhere on the picture are Franco Farne, Carlo Pedretti and Caracchi (NCR). The bike out accelerated EVERY other bike coming out of the Tosa-hairpin, so I think it couldn't have been a 600. At that time, the French team were running the very fast RSC1000 Honda along with Bakker Kwacks and all the other frame-specialists of that time. Due to the French-Italian Wine-war at that time, the Italians made it very difficult for the French teams, at the border and at the track. The French responded by boycotting the event, at least the French factory-entries, due to "poor lighting at dark". Ducati set pole, in broad daylight, Because of the boycott, which only affected about ten teams, the starting-grid, Le Mans style, was a bit thin up front. 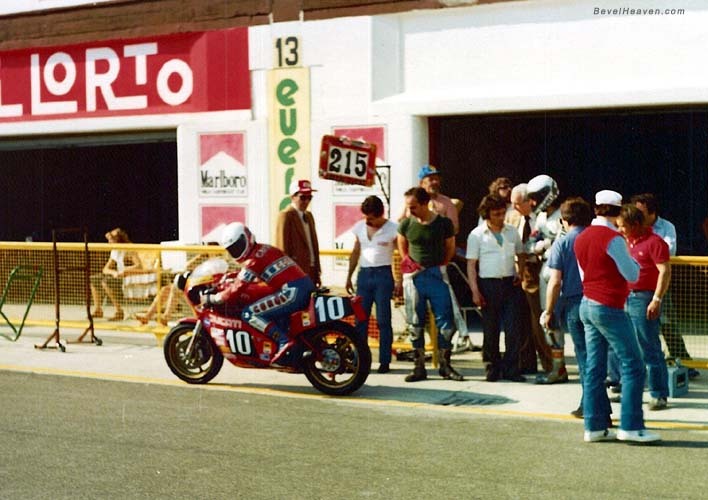 The Duc had to be started by aid of a LARGE battery, with a couple of large cables over the pit wall, and with a specially designed plug, type arc-welding, to get the juice flowing and quickly disconnected before the very eager Mauro Ricci could take off. Got all that somewhere on film i think. Have to clean the fourth floor sometime during my holidays. Mauro got away late, no wonder, and came through leading after a few laps. Starter engine broke and damaged the cases. Exit Ducati by 1 am.